Market traders in Leicester have been banned from selling a football T-shirt with slogans about English victories in the World Cup and World Wars. A city council spokesman said the shirts "could cause offence" and offered to help traders get refunds. 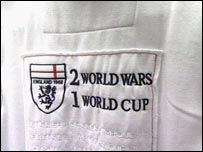 The shirts are emblazoned with "2 World Wars 1 World Cup". Traders said they were responding to demand. One trader said he would stop selling the T-shirts but added he might not get his £1,000 investment back. Nick Rhodes, head of markets for Leicester, said: "It is referring to the World War and it is a bit unnecessary - I can understand the traders trying to jump on the popularity of the World Cup." The council, which runs the market, can stipulate which products are sold and can ban anything that is deemed offensive. Mr Ran, a market trader at Leicester Market, told BBC News: "This is a really silly thing - people all across the country are selling these T-shirts - this is all about sport - it is not about insulting anyone." A shopper at Leicester Market said: "I don't think you should sell anything that glorifies war in a cheap way like that just to make a profit." Mr Rhodes added: "The market is a focal point for the city and we don't want to offend anybody and we have asked traders to stop selling them. "We haven't had any complaints yet but we want to stop the sales before the complaints happen - and inevitably they will." "Traders can take the T-shirts back to the manufacturer and ask for a refund and I am prepared to send a letter to the firm to say we are not allowing them to be sold on the market."